Branson Music Festival 2019 is the highlight of Ozark Mountain Springtime in Branson. This special, two day event is jam packed with all of the music and talent that makes Branson so magical. The Oak Ridge Boys, Clay Cooper, The Haygoods, Mickey Gilley, Johnny Lee, and Million Dollar Quartet are just a few of the many headliners set to perform this year. 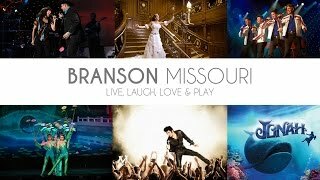 Hosted by Branson Travel Planning Association, the Branson Music Festival will take place April 26th and April 27th , 2019 and is a great way to see most all of Branson’s beloved entertainers in one spot. With 10-12 performers taking the stage each day, it’s no surprise that the American Bus Association has named it one of its top 100 events in North America. Along with ‘top notch’ entertainment, this year’s Music Fest will feature some friendly competition between you and your favorite stars. Audience members will be selected to team up with celebrities and compete in a fun, game show style contest that is sure to make for some hilarious stories to take back home. Prizes will be given and a great time will be had by all. Branson is steeped in talent and holds some truly fascinating history. During the entertainment portion of the event and in between sets, a few of Branson’s ‘historical characters’ of yesteryear will narrate some of the Ozark’s more captivating days of old. These ‘characters’ will weave together the Branson legacy and lore as portrayed by Ruben Branson, Rose O’Neil (creator of the Kewpie Doll), Jim Owen (one-time mayor of Branson), John & Anna Ross, and other founding pillars of the Branson legacy. A trip to Branson isn’t complete without a tiny bit of shopping! This year’s event will host a sampling of some of the best local retailers, showcasing their wares and inviting you to browse through their booths inside the comfortable and climate controlled Welk Theater lobby. Springtime in the Ozarks is beautiful in more way than one. Besides the jaw dropping scenery, Ozark Mountain Springtime means Branson comes to life to celebrate the dawn of a new season, bringing you Branson Music Festival 2019. The Branson Spring 2019 event showcases all the wonderful things that Branson offers all year round including delicious food, amazing entertainment and warm hospitality. Shake & Howdy!!! A free morning event at the Welk Resort featuring some of Branson's most legendary artists. It's great time to meet the stars, ask questions. shake a hand, howdy & make a friend. All while enjoy a fresh from the oven biscuits & a cup of coffee. It's a great way to start the day! Friday: Billy Yates & Timothy Haygood.